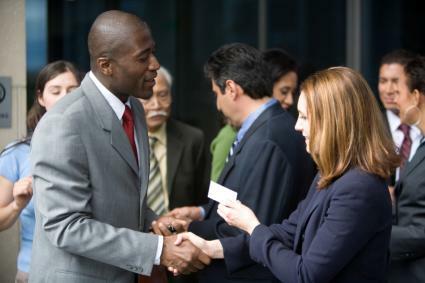 Business networking is important for professionals at every career level. Whether you are just starting in your career, own your own business, or are moving up the corporate ladder, building a strong professional network can have a strong positive impact on your success. There are many different resources for building a professional network. Keep in mind that joining a lot of groups only so your name is on the membership roster will not help you build a network. You'll need to actively participate to benefit. Choose a few options that are in alignment with your professional goals and get involved so you can make meaningful contacts. Field-specific professional associations provide outstanding networking opportunities for professionals at a national and local level. For example, the Society for Human Resource Management focuses on the needs of HR professionals. At a national level, the organization offers legal updates, educational opportunities, expert advice and other services. There is also a network of local chapters members can join to get to know people with similar jobs in their geographic area. There are similar organizations for accountants, PR practitioners, engineers, and just about every other occupation. Use the Gateway to Associations provided by the American Society of Association Executives to search for similar groups specific to your occupation. Select a group that will introduce you to professionals who can potentially help your career; if you work in sales, for example, look for groups that attract members who are decision-makers for the types of products and services that you have to offer. LinkedIn is a leading social networking site focused on professional networking. Modern professionals are well-served by learning how to use LinkedIn as a networking tool. This can be a great way to strengthen your presence with current contacts, as well as to reconnect with people you have worked with or attended school with in the past. It can also be a valuable tool for making new contacts, finding out about job and business opportunities, and networking with like-minded professionals through special interest groups created on the site. Becoming an active member of the Chamber of Commerce in your local area is a great way to raise your professional profile and ensure that your organization is viewed as an active supporter of economic development in the local community. Chamber memberships are typically beneficial for companies, with employees of member organizations being able to participate in various Chamber-sponsored networking activities and events. Getting involved in Chamber functions is an excellent way to raise your professional profile while expanding your network of business contacts. Visit the Chamber Directory page provided by the U.S. Chamber of Commerce to find the organization in your area. If your college has an active alumni association, participating in the group can be a great way to expand your network of business contacts. Becoming a member will provide you with access to alumni resources you can use to keep in touch with, or connect with, people who attended your alma mater. If you live in an area where quite a few graduates live, there may even be local alumni association activities you can attend from time-to-time, providing you with a way to meet and network with others in your area who went to the same school. Getting to know people in an environment where common ground is already established can help you expand your professional network beyond individuals that you interact with through your job or other groups. Business Network International (BNI) is a group designed to help professionals grow their businesses though referral marketing. If you are a small business owner or sales professional, becoming a member of a local BNI chapter can be a great way to get to know people who are actively looking to build their own businesses through networking and who are willing to do the same for you. Chapters typically meet once a week at the same time and location, and membership is limited to one member per business type. Meetings are structured so that each member has 60-seconds per week to "pitch" their products or services to the other members with the idea of educating each other about how to best refer business back and forth. Members also pass referrals to each other during the meetings. Find a local BNI chapter and attend as a guest to see if the format might benefit you. Finding and joining appropriate networking groups is the first step in building a professional network. Before you start attending meetings, however, it's important to know what's involved in networking effectively. If you go into these groups with the wrong approach, you might find that your efforts are less-than beneficial. Realize that people will not respond well to individuals who go into networking activities with a selfish, what's-in-this-for-me attitude. Maintain a positive, helpful attitude in your networking endeavors, focusing at first on what you have to contribute and offer. When the people you meet see that you are happy to be of service, they'll likely respond in kind. When you go to a networking event, don't expect people to reach out to you if you're hovering in the corner or sitting quietly in the back of the room by yourself. Be proactive in introducing yourself to new people through the event. This will be much easier if you come up with a way to open conversations ahead of time. Don't stick with the same person throughout a networking event. It's easy to allow yourself to latch on to someone you know or the first new person you meet when you are at a networking event, but doing this will not help you expand your network. Instead, set a goal for yourself in terms of how many new contacts you want to make and force yourself out of your comfort zone to reach out to new people. Don't go to a networking event without making sure you are properly prepared. Have a stack of professionally printed business cards where you can reach them without having to fumble through your purse or briefcase. Be prepared to answer questions about what you do briefly and succinctly. Practice how you'll respond to such inquiries ahead of time, keeping your initial response to one minute or less. People will be turned off if it takes you forever to describe your business or if you fumble your way through explaining it. The way you present yourself can have a powerful impact on how people view you as a professional. It can even determine whether or not people are responsive to engaging in dialogue with you at networking events. Even if your office has a casual dress code, wear professional attire when engaging in face-to-face business networking events, making sure you are dressed and groomed in a manner that other professionals are likely to react to in a positive manner. Joining the right groups and approaching your membership with a proper attitude can go a long way toward helping you build a strong business network that can be valuable to you throughout your career. The people you meet may become your customers or vendors, or they may refer prospective clients or employees to you in the future. They may even help you find a new job at some point in the future, and you may be able to return the favor. You never know where a mutually beneficial business relationship may go.